Developers of a new, clean and efficient process for coal-based power generation say it will not become popular unless the government enforces stricter environment protection standards. SCIENTISTS at the Indian Institute of Chemical Technology (IICT) in Hyderabad have developed clean fuel, a coal gasification technology, but are finding no takers, even though their new technology is important, given the worldwide concern for global warming and pollution from thermal power stations and the fact that India has vast coal resources. IICT director A V Rama Rao says, "I am sure this is the best option as far as coal-based power generation is concerned." In the conventional technologies used in India, the high content of ash and quartz in coal poses some difficulties. Quartz damages the grinding machinery that pulverises coal and disposing ash is a problem. Noxious sulphur dioxide produced in traditional methods finds its way into the atmosphere and comes down as acid rain because flue gas desulphurisation plants are too expensive to be introduced in India. The efficiency of pulverised coal technologies has plateaued at 36 per cent -- and it is not expected to improve, according to T S R Anjaneyulu, head of the coal division at IICT. In fact, efficiency is likely to fall, he argues, because more and more coal is being extracted using open-cast mining techniques that increase their ash content. Many gasification systems have been developed in different parts of the world, and about 30 versions are now available at commercial or near-commercial levels. The largest number of installations is in South Africa, where nearly 100 gasifiers produce 50 per cent of the country's petroleum products, Anjaneyulu disclosed. The new coal gasification technology has an efficiency of 43 per cent, which can be raised to 47 per cent with high-tech innovations. In this coal gasification technology, which is also less polluting, IICT scientists use a system called the integrated gasification combined cycle. It uses both a gas turbine and a steam turbine to generate power. 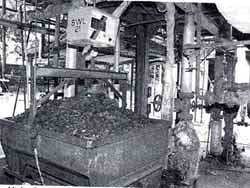 Coal is gasified using oxygen-steam or air-steam as the gasifying medium. The coal gas is cleaned and then burnt in the gas turbine. The exhaust from the gas turbine is used to generate high-pressure steam in a heat recovery steam generator. Additional power is generated using this steam in a steam turbine. The gas obtained when using oxygen-steam has a higher calorific value -- heat-generating ability -- and contains mainly hydrogen, carbon monoxide, methane and carbon dioxide. If air is used instead of oxygen, the resultant gas has a lower calorific value and some quantities of nitrogen as well. The moving-bed gasifier used at IICT operates on the principle of counter current contact between the descending coal and the rising gases. The moving coal bed has different zones. Solid coal entering the reactor is first heated to 550-650oC and dried by product gases leaving the gasifier. The coal is dried further and converted to char by the rising hot gases in the volatilisation zone. The char is then gasified by steam and water and the residual char is burnt with oxygen to generate heat. The temperature in this region of the reactor is maintained at 1,000-1,200oC to prevent the ash from fusing. It takes about an hour for coal particles to move down the gasification chamber and get gasified. Liquid tar and oil are produced as byproducts and can be processed to obtain valuable chemicals. Also generated are coal particles that can be briquetted and re-used. Sulphur is recovered before the product gases are burnt in the gas turbine, reducing sulphur dioxide emissions. As two-thirds of the power generated is produced by gas turbines, water consumption is about 60 per cent lower than in traditional thermal plants. Research on coal gasification at IICT has been undertaken to adapt it to Indian high-ash coals. Says Anjaneyulu, "Gasification tests on a large scale are necessary to collect data to establish a commercially viable plant." Plans to set up a pilot plant were mooted in the mid-1960s, but the plant became operational only in December 1983. Some of the machinery was acquired from Germany and France and analytical equipment was imported with a US$ 1.2-million grant from UNDP. A number of trials using coal from six different coalfields, including Singrauli, North Karanpura and Godavarikhani-Ramagundam, were conducted. Lignite from Neyveli with a high ash content, of which reserves of 3,300 million tonnes exist, also was tested. Scientists found gas quality decreased as coal ash content increased, but this did not influence the performance of the gasifier. However, the amount of high-ash coal that could pass through the system each hour decreased. A 6.2 MW demonstration plant has been set up in Tiruchirapalli by Bharat Heavy Electricals Ltd (BHEL) with the help of technology developed by IICT. Though the plant does not function on a regular basis, "our work and that of BHEL shows that this technology can be both cost-effective and clean," says Anjaneyulu. However, as capital costs are high and the cost of electricity production is 12 per cent higher than conventional systems, the technology has not attracted either private entrepreneurs or government corporations. At a recent clean-technology seminar in Bombay, Anjaneyulu expressed his disappointment with the response and stressed it is necessary for the government to lay down more stringent environmental conditions to ensure this technology is picked up.